Marburg (1955 pop. 24,000; 2005 pop. 175,000), a city in Hesse, Germany, was a center of the Anabaptist movement in Hesse and the neighboring Thuringia in the Reformation period. Melchior Rinck was cross-examined here by Balthasar Raidt, the pastor of Hersfeld, and the theological professors of the University of Marburg. On this occasion he wrote his confession of faith on five points. In the Marburg Colloquy (1529) between Zwingli and Luther, Campanus took part. In 1536 four Hessian Anabaptist leaders, including Hermann Bastian, who probably stemmed from Marburg, were imprisoned in Marburg, and were kept in light confinement alternately here and at Wolkersdorf. Philip of Hesse requested an official opinion of various university cities. The theological faculty of the University of Marburg also sent one; it has, however, been lost. Marburg seems to have rendered a mild judgment; for a year previous Gerhard Noviomagus had expressed to Philip his opposition to severe penalties against the Anabaptists. This was also the position of Adam Krafft, who had been a professor at the university and a pastor at Marburg since 1528. The prisoners were repeatedly examined. A written confession of faith was found on one such occasion with the title, Verantwortung und Widerlegung der Artikel, so jetzund im Land zu Hessen über die armen Davider, die man Wiedertäufer nennet, ausgangen sind. Finally Martin Bucer was called, who debated with the prisoners from 30 October to 1 November 1538, and succeeded in converting them. Nevertheless there were remnants of Anabaptist groups in Hesse and vicinity for a long time after. The General Synod held in 1571 adopted a resolution with the following import: Since the Anabaptists now and again come secretly and dare to mislead the common people with their seductive teachings from the right way of salvation to destruction, the superintendents shall diligently watch for them and their meetings and conventicles, also lead them and oppose them with teaching and admonition from God's Word as much as possible. The prince ought to renew his mandates threatening all converts to Anabaptism with severe penalties, expelling those from the country, who refuse to recant. The Synod of Marburg in 1573 recommended that the property of Anabaptists to which they fell heir after banishment be confiscated to prevent the return of such Anabaptists to poison others. In 1575 the pastor of Alsfeld reported to the Marburg Synod that one of his parishioners had been infected with Anabaptism for fifty years and could not be persuaded to change his mind. Two Anabaptists, Martin Richter and Hans Kuchenbecker, had drawn the attention of the authorities, while the others were living quietly. Kuchenbecker had been examined at Marburg in 1577, and made a courageous confession. He was given two months to change his mind, at the end of which he was to be expelled if he persisted in his error. On 7 October 1578 the pastor Tielmann Noll was summoned before the Marburg Synod to answer charges of Anabaptist leanings. His reply clearly shows that he had received genuine inspiration from his association with the Anabaptists. He then had to pass an examination on all the articles of the Confession of Augsburg, and for a year withdraw from all social activity, or forfeit his position. After this the Anabaptists did not come to public attention, but their quiet life remained an influence for a long time to come. Hege, Christian and Christian Neff. Mennonitisches Lexikon, 4 vols. Frankfurt & Weierhof: Hege; Karlsruhe: Schneider, 1913-1967: v. III, 34 f.
Neff, Christian. "Marburg (Hessen, Germany)." Global Anabaptist Mennonite Encyclopedia Online. 1957. Web. 21 Apr 2019. http://gameo.org/index.php?title=Marburg_(Hessen,_Germany)&oldid=92578. Neff, Christian. (1957). Marburg (Hessen, Germany). Global Anabaptist Mennonite Encyclopedia Online. 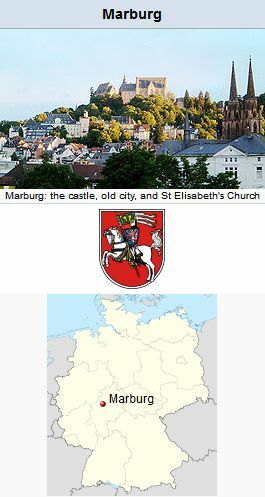 Retrieved 21 April 2019, from http://gameo.org/index.php?title=Marburg_(Hessen,_Germany)&oldid=92578. Adapted by permission of Herald Press, Harrisonburg, Virginia, from Mennonite Encyclopedia, Vol. 3, pp. 476-477. All rights reserved.